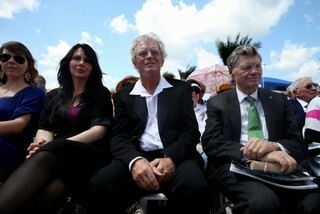 Marton Varo sits next to former Ave Maria President Tom Monaghan during the revealing of the Annunciation sculpture. After three years of planning and hundreds of hours of sculpting by artist Marton Varo, Ave Maria University’s Oratory revealed it’s new facade to hundreds of people on March 25, 2011. The project from inception to fruition took nearly 3 years and more than 3 million dollars to achieve. It is the first project to be undertaken by the Ave Maria Foundation for the arts completely funded by private donations. The relief depicts the Annunciation of the Blessed Virgin Mary in 120 tons of Carrara marble hand selected from Cava Michelangelo, the same quarry Michelangelo used to acquire his marble for his most important works. Once the project began Marton made several trips back and forth from Italy to Ave Maria carving portions of the relief in both places. The smaller five pieces were carved in Italy while the larger stones measuring 210 cm x 230 cm were carved at Ave Maria, making the largest blocks almost 7 1/2 feet tall.